Khalid Mohidin picks three youngsters – a batsman, a bowler and an all-rounder – to watch during the 2019 One-Day Cup campaign. 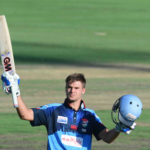 Tony de Zorzi starred with a ton, as the Titans claimed a 95-run bonus-point win against the Knights in Kimberley on Friday, while the Warriors beat the Dolphins in Durban by seven wickets. 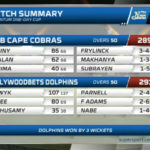 Watch highlights of the Dolphins’ three-wicket victory over the Cobras at Boland Park in the One Day Cup. 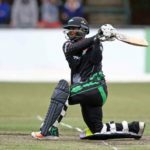 Morne van Wyk smashed 107 before Robbie Frylinck hit successive sixes off the final two balls, to claim a three-wicket win over the Cobras. 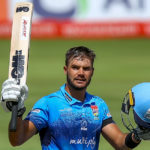 Dane Vilas produced a sparkling innings of 91 off 68 balls as the Dolphins beat the Cape Cobras by 26 runs at Kingsmead in the Momentum One-Day Cup. Jon-Jon Smuts and Christiaan Jonker steered the Warriors home, as they eased past the Lions by six wickets on Wednesday. 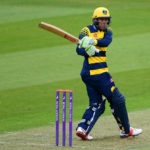 Colin Ingram scored his third century in four matches as Glamorgan beat Kent by 15 runs in the One Day Cup. 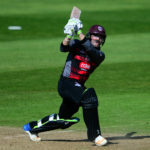 Despite Dean Elgar’s fifth fifty-plus score in a row, Rilee Rossouw blasted 156 for Hampshire to beat Somerset in the One Day Cup. 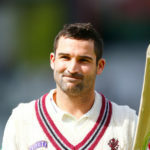 Dean Elgar posted his third score of fifty or more as Somerset made it three wins out of three in the One Day Cup. Jacques Rudolph scored a century for Glamorgan in the One Day Cup on Thursday evening, surpassing 10 000 List A runs as a result. We select our top performers across the formats in the 2016-17 domestic season. We take look at the stand-out stats of this year’s One Day Cup campaign. The Titans’ record-breaking 425-5 allowed them to complete a crushing 236-run victory against the Warriors and win the One Day Cup.